There are trends that come and go. Hemlines and necklines rise and fall, silhouettes billow and taper, and occasionally, against our better judgement, bell-bottoms and shoulder pads are considered 'cool'. Then there are the classics, the wardrobe staples that endure year after year, and bridge the generation gap between retro and modern. When it comes to prints, the polka dot is definitely on top of the list as a classic. And since we're in that sweet spot where the weather is cold enough to layer stylishly, and not quite warm enough for spring florals, they're the perfect trend to rock. Most fashionistas know to take one basic garment as the foundation of their outfit, and build on it with accessories. A bold print can make enough of a statement as to require minimal accessorising. Polka dots are particularly versatile so change a few small pieces here and there and you have a whole new look. This is particularly true of saris. Let's take a white and red polka-dotted sari for example. Wear it with a red halter-neck sleeveless blouse, sky-high heels, smoky eyes and a killer updo, and you're ready to party. If you play it down with a quarter sleeve white blouse with glass bangles, winged liner, a single braid and maybe a teep, you're a vision from Bangla love poetry. Or you can even go for a contrast, by picking a black blouse, pumps and bright red lips, and you're femme fatale. With a shalwar kameez ensemble you can rock two trends at the same time and make it work: colour blocking, and mixed prints. Let's say your kameez has big red dots on a white background. You could pair this with a shalwar that has smaller white dots on a red background (the red has to be the exact same shade for this to work). With all the cut-pieces and patchwork in vogue right now, you can even amp it up with maybe a third or fourth combination worked in as a detail on the kameez and orna, but remember to have at least a unifying theme that ties the whole look together. And the number one rule when working with mixed prints is: keep your accessories neutral. Let's say, though, that you think owning a polka dot outfit is too much of an investment, you can always opt for single pieces that you can mix and match. A chiffon blouse or a longer silk kurti in a bold polka pattern look great when teamed with the season's hottest coloured skinny jeans. Or you could reverse it and opt for dotted leggings worn with a solid top. Printed trousers have been all the rage on the catwalks lately, so grabbing a pair of polka-dot slacks to wear with a solid blouse might be a fun experiment. One word of caution, though, for pants and leggings you want to choose either a tiny print, or very large ones. Medium-sized polka dots do not make for flattering legwear. If polka-dotted clothes are too mainstream for you, you can still own the trend by investing in dotted accessories. Scarves, hair-bands, shoes, purses, belts...any of these in a nice bright polka print can jazz up a plain outfit. If you're feeling really creative you can even try a polka dot manicure. From saris to shoes, there's no dearth of options for experimentation. All you have to do is connect the dots and pick what works for you. In the hairstyle world the year 2013 was ushered with a bang, both literally and figuratively. When President Obama took his oath as the President of United States, the spotlight was not on him but on the First Lady standing next to him. Michelle Obama's newly-acquired bangs created a massive stir; so much so that the President joked that the presidential inauguration was less about him and more about his wife's new hairstyle! On the other side of the pond, the ever-stylish Duchess of Cambridge Kate Middleton's bangs also made fashion pundits around the world sit up and take serious notice. Bangs have been declared as the hottest new trend for hair in 2013 globally! For a certain hairstyle to gain precedence over others, practicality is of utmost importance. Women around the world want a cut that is effortless, practical and easy to style at home and looks chic and beautiful, all at the same time. 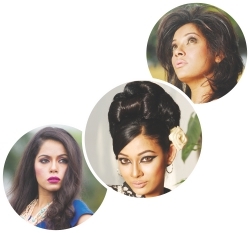 A simple tweak such as bangs pertain to all the aforementioned aspects where one does not have to compromise or experiment with the length of the hair too much, as we Bengali women like to wear our hair slightly long. Not only are bangs stylish and simple, they also take years off its wearer's face. Due to its erstwhile association with schoolgirls it has a definite youthful air to it. By covering the forehead it may sometimes help shield a receding hairline and fine lines. And since it can be personalised in many different ways, it is also tremendously versatile. While bangs are lauded for their simplicity, there are certain nuances. They are often confused with fringes, which are longer and layered, and may sometimes even frame the face. Bangs are essentially short, ending right on top of the eyebrows or slightly below it. This year's bangs are bluntly cut, in bold chunks. The ends are thicker and fuller, giving its wearer a rather rounded look. For those who intend to experiment can go for the short crop, keeping the length just a few inches above the eyebrows. The ends are sharper and separated, like Audrey Hepburn, the eternal reference for ingénue-like bangs. It has to be blow-dried with a round brush, and hair gel can be used to achieve the pointy ends. Shorter bangs also help women with square or round-shaped faces, by contouring the wideness of jaw line. The result is refreshing and youthful, and lends a bit of an edge to the wearer. 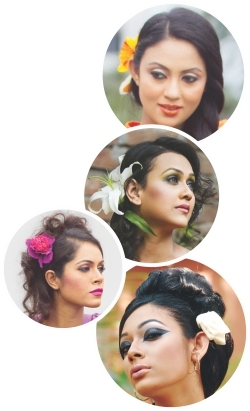 However, do keep in mind that this look is more suitable for young women not shying away from experimenting. To those who do not wish to play around and yet covet something new, the slightly longer version may be a great option. The bangs are thickly cut in chunks, either sweeping the eyebrows or brushing with the eyelashes. To style this kind of bangs have to be blow-dried with a round brush to prevent them from falling flat, and a touch of styling pomade will keep flyaways at bay. Lastly a single sweep with a flat iron will keep the bangs neatly placed. Women with narrow or long faces can benefit from this type as it creates a rounder, fuller facial silhouette. Hollywood celebrities like Zooey Deschanel and Jessica Biel are proudly sporting the bold bangs with flair. This kind is appropriate for all age groups, as it is universally flattering. If your long list of resolutions for the new year includes getting a new hairstyle to revamp your whole look, then “The Chop” maybe your calling. It is a refreshing new take on the classic Bob, an eternal favorite with fashionable women around the world such as Anna Wintour, the editor of US Vogue. Those of you who have long hair and find it boring and constricting can give this hairstyle a shot. While the bob is quite short and blunt, The Chop is slightly longer in length and has some layers to give hair movement. Meant to be kept natural, it does not have to be neatly blow-dried every time you step out of the house. In fact, it is slightly layered and the length can be anywhere between the chin and the shoulder to encourage the natural, windswept look. And since it is comparatively shorter yet layered, it brings one's face into focus. As the concepts of beauty are moving forward, breaking free of erstwhile constraints, trends in hairstyle are also following suit. The Chop is the harbinger of a new era in hairstyles, where women don't have to remain bound to their hair straighteners and blow-dryers all the time. Fashion magazines are urging women with The Chop to just wash their hair and let it air dry, to let it gain its natural wave and volume. Bangs are an interesting addition; both long and short kinds are equally flattering. Simple and feminine, The Chop is a fresh and trendy way to uplift your look entirely this year. Trying on a new hairstyle can be either fun or a daunting task. Even more so when it involves stepping out of your comfort zone and being daring and at times, risqué. But it is hard to go wrong with something as unique and simple as bangs. If you are yearning for a fun, exciting new look, bangs may be the right answer for you! Every product has a value chain which comprises of all activities that add something of value to the product till it reaches the hands of the consumer. Consequently, at each of these stages of value-adding a cost is incurred. You may wonder why we are going all Business 101 on you, but, this is because as consumers, hopping off to the nearest department store to get that bag of Barbeque Flavoured Pringles or to the store at the shiny mall to grab a bottle of perfume for that special someone has direct implications on your wallet. An awesome place to get your hands on all the fancy imported stuff that you get at retailers' but at much lower prices is the Gulshan-1 Wholesale Market. Most of the time we do our shopping from well-renowned retailers and shopping malls, especially when it comes to imported products, often not realising that they are just another addition to the value chain and thus, charge us a premium for getting the product to us. For those who use imported products regularly the price difference between the Gulshan-1 wholesale market and regular retailers are palpable. The Gulshan-1 wholesale market is one of the places that a large number of retailers get their imported products from, thus, this place has a huge assortment of products starting from food to cosmetics and make-up to gifts. As they usually sell in bulk they also charge much less on most products and even if you are buying only one unit of a product they charge you the same. Situated on the left-hand side of the second floor of the Gulshan-1 market building with a subtle separation from the regular stores on the floor, the wholesale market consists of 3-4 rows of small stores carrying different categories of products usually sticking to one category, like food or cosmetics. There are a number of food stores that have almost everything you may need including some stuff that is hard to come by generally at retailers'. For instance if you are looking for some herb or cooking sauce for a recipe you just jotted down from Nigella, there is quite a good possibility that you will find it here. Frozen food, canned food, unusual spaghetti, instant food mixes, sauces, foreign herbs -- you name it you get it here. Especially for those who are really into cooking, this market is a must visit. Moreover, if you use ingredients like canned mushrooms, tomato pastes, etc. regularly the lower prices here will definitely be an incentive. When it comes to cosmetics the Gulshan-1 wholesale market has most well-known brands that are usually sought after, such as L'Oreal, Maybelline, Garnier, Tresemme and the list goes on. The plus side is you get to save a hefty amount on these and since these are everyday-use products that will come as a relief. For instance, a 600ml bottle of Tresemme shampoo that usually costs around Tk.900 at retailers' costs around Tk.700 here, while Neutrogena face-washes are charged almost Tk.200 to 300 less than at retail stores. The market has two to three tiny stores dedicated completely to make-up and is a treat to the eyes with shelf upon shelf of enticing colours. A number of the stores have a collection of all the latest and popular perfumes but, a problem here is that most stores do not provide a tester. On the positive note, there is a scope for bargaining. There are a few gift shops too, a couple of which carry very pink stuff, something that will launch the squeal mode in young girls. These shops carry a collection of gift items and stationery. Finally, if you are one of those people who usually have chocolate toppling out of their refrigerators the couple of chocolate shops here will be bliss for you. These tiny shops, although a bit dull and gloomy, have boxes upon boxes of Toblerone, Cadbury and the likes and are delightful just to look at. 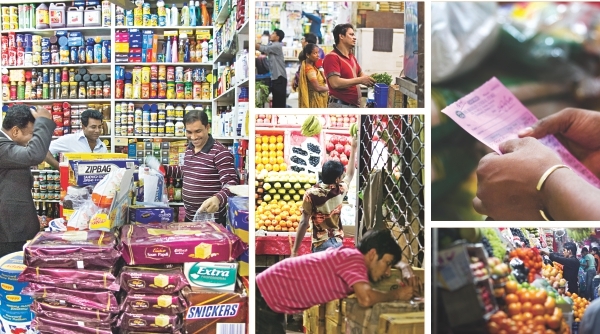 The only trouble you will face here is the fact that the only payment mode is cash and you will not be able to stroll around with your stuff in a trolley; other than that the Gulshan-1 Wholesale Market is a place where you can get your shopping done much more economically.